The experienced and professional ASE Certified Technicians at Scott’s Auto Repair will handle all of your auto repair and maintenance services in Houston, TX quickly and efficiently! We have been providing top quality auto repair in Houston and the surrounding areas since 1986, and are focused on building long-term relationships with our customers for total customer satisfaction. At Scott’s Auto Repair, our talented Houston mechanics utilize state-of-the-art technology and diagnostic equipment to properly diagnose and handle any car repair and car maintenance services on all makes and models of domestic and import vehicles. In addition, we offer an industry-leading 3 year/36,000 mile nationwide warranty, financing options, loaner cars, a free local shuttle service and free Wi-Fi Internet in our waiting area! It's these extra details, and personal care that make Scott's Auto Repair Houston's choice for automotive services. 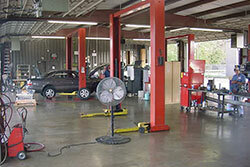 We provide oil changes, brake repair, tire rotations, factory-scheduled maintenance, and more. 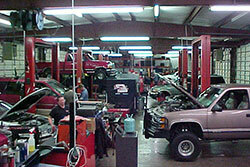 At Scott’s Auto Repair, we stand behind all of the auto repair services we provide. To further this commitment, we are proud to take part in the ACDelco Consumer Assurance Program. With this program, any ACDelco part that we install comes with a 12 month/12,000 mile nationwide warranty, so no matter where you are if the part fails, you are still covered!